While I try to eat a perfectly balanced diet most of the time, there are just going to be those days where being healthy falls to the wayside in favor of treating myself to a something indulgent. On weekends, my usual breakfast of overnight oats or a smoothie turns into an all-time favorite: French toast. I fully condone having a treat once in a while, which is where my daily vitamins come into play. If you eat a perfectly healthy and balanced diet 24/7, you are probably getting all the nutrients you need from your food…and I envy you. But if you’re like me, taking the right supplements will give your body the vitamins and minerals it needs on those days when an afternoon ice cream cone sounds better than a bowl of fruit. 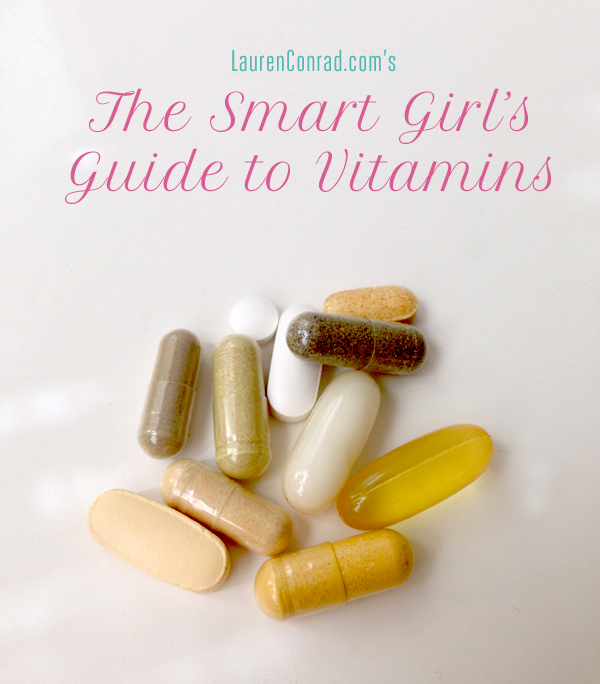 If you’re going to choose one vitamin from this list, it should be a multi-vitamin that is made for women. Make sure it has folate or folic acid, which is very important for women ages 18 to 40, who someday want to have a family. A good multi-vitamin will give you a daily dose of all the things you should be eating in your diet…and more! Biotin is one of my personal favorite vitamins because it has worked miracles on my hair, skin and nails. I take 500 micrograms a day, and ever since I started I have noticed that my hair is longer and shinier, my skin is clearer, and my nails are stronger. Many multi-vitamins have biotin in them already, so be sure you’re reading your labels. Iron is a great supplement to take for women who are menstruating because your body loses iron every month. You only need about 10-20 milligrams, but it work wonders by delivering oxygen from your lungs to the rest of your body. If you eat a lot of red meat (say, a serving every day) you might be getting enough iron to skip this supplement. Leafy greens like spinach and kale are also great sources of iron. Zinc is an important mineral that boosts our immune systems and helps to fight off disease. And it is an especially important vitamin for vegetarians or pregnant women. If you’re a veggie lover, you probably eat a lot of legumes, which prevent zinc from properly absorbing in your body. If you’re expecting, you should also up your zinc intake because your little one will be using up most of the amount that’s in your body. Make sure you’re getting between 8 milligrams and 11 milligrams of zinc daily. This omega-3 right supplement is fabulous for healthy hair, skin and nails, and will support your heart and blood systems. The long list of fish oil benefits also includes helping with depression, preventing painful periods, and lowering cholesterol. Take about 1-2 grams per day. The main job of vitamin D is to regulate the absorption of calcium and phosphorus in your bones and keep your cells happy and healthy. The great thing about this vitamin is that our bodies can actually manufacture it naturally…that is, when we’re exposed to sunlight. If you live somewhere with constant cloudy weather or long winters, you might not be getting enough vitamin D. Taking 3000 IUs should help to get you back on track. Resveratrol is the powerful antioxidant that is found in grapes and red wine. Therefore, just like red wine, it has amazing anti-aging properties and is long believed to help fight cancer and heart disease. Take one capsule per day and soak up those antioxidants. One of my personal favorite vitamins that I take each day is called Green Vibrance by Vibrant Health. Each capsule is filled with organic greens, freeze-dried grass juices, and concentrated super foods. I love it because when I’m having a day where I’m constantly on the go (a.k.a. living off of coffee and snacks I can easily bring in my car), this supplement has a lot of the nutrients and vitamins I would get if I had the time to sit down and eat a big leafy green salad. It certainly does not replace real fruit and veggies, which should be a staple in your daily diet. But it’s packed with a lot of good stuff. You can also buy it in powder form to add to your smoothies. Calcium is one of the most important supplements young women can take to strengthen their muscles, bones and teeth. And, studies show that when it’s taken as a combined calcium-magnesium supplement, it allows both vitamins to absorb better into your system. Just remember to take this supplement separate from your other vitamins and on an empty stomach—otherwise it can interfere with the absorption of your other nutrients. The recommended dosage is 1000 milligrams of calcium and 400-600 milligrams of magnesium. Taking a great probiotic supplement is an amazing way to maintain intestinal functions and keep your gut and stomach healthy. Probiotics are live organisms that are considered “good” bacteria, or bacteria that strengthen the immune system and help us to digest food. My favorite probiotic is Dr. Ohhira’s Probiotics Original Formula. Just like calcium-magnesium, make sure to take this supplement on an empty stomach as well. As with all things in life, take these suggestions in moderation. Just as there are side effects for eating too much of anything, there are side effects for taking too many vitamins. Do what feels right for your body, and contact a nutritionist or a trusted doctor to help you come up with a routine that works for you. What vitamins do you take daily? Also, what health topic would you like me to cover next?